get excited, friends, because it’s NATIONAL S’MORES DAY! if that’s not an excuse to make a ridiculously decadent s’mores-related dessert, then i don’t know what is. i debated making my delicious s’mores cheesecake again, but decided at the last minute to try something new: a s’mores coffee + fudge ice cream cake topped with toasted marshmallows. sounds good, doesn’t it? well, it is – super flavorful + chocolaty, while still being wonderfully refreshing on these hot summer days. the variety of flavors+ textures in the cake is just wonderful! while the cake is simple to make, note that it takes some time since you have to freeze the cake after each layer. i intended to serve this to our dinner guests on monday evening, but my poor planning meant that it wasn’t ready in time. thankfully, i had a batch of no-bake coconut + almond brownies on hand to feed ’em. crisis averted! i hope you all spend this momentous holiday doing something s’moresy! i’m going to grab some graham crackers, marshmallows + chocolate + have myself a s’mores party. or, maybe i’ll just sit down to another piece of this amazing, decadent, s’mores ice cream cake! 16 whole graham crackers – i used chocolate graham crackers for additional chocolaty goodness! preheat oven to 350°F. finely grind graham crackers, toasted almonds + 3 tablespoons sugar in processor. add 1/2 cup melted butter; process mixture until moist crumbs form. press graham cracker mixture onto bottom + up sides of 9-inch-diameter springform pan with 2 3/4” high sides. bake crust until edges are golden, about 12 minutes. cool graham cracker crust completely. spread 2 cups softened ice cream in crust. spoon 3/4 cup cooled fudge sauce over. freeze until sauce is set, about 30 minutes. refrigerate or freeze remaining ice cream as necessary to prevent ice cream from melting. repeat layering with 2 cups ice cream, then 3/4 cup sauce. freeze until sauce is just set. spread remaining 2 cups ice cream over. cover + freeze cake overnight. refrigerate remaining fudge sauce. preheat broiler. warm remaining fudge sauce in small saucepan over low heat. remove from heat. place cake in pan on baking sheet. spread marshmallow creme over top of cake. sprinkle miniature marshmallows over in single layer. broil just until marshmallows are deep brown, watching closely to avoid burning, about 1 minute. run knife between pan sides + cake to loosen. remove pan sides. cut cake into wedges. serve cake immediately (with remaining warm fudge sauce, if desired). Oh. My. Goodness. That is the ultimate celebration of National S’mores Day! I bet it was heavenly…and I hope that’s what you served your dinner guests the other night. Their taste buds probably were in shock at the mere deliciousness of the s’moresy dessert! Yum. caroline, this cake is just amazing. so decadent + creamy + chocolaty, in a perfect ice cream cake form. in fact, i think i just sold myself on having some for breakfast. ha! thank you!! i think i’m going to compile all the s’mores-related recipes posted/linked today + link up to all of them. the more s’mores, the better! drool! Oh my goodies, this looks TO DIE for!! it is swoon-worthy for sure! yours look wonderful + i love that you’re compiling lots of other s’mores recipes to share, too. thanks for linking to my recipe + happy s’mores day! It’s 105. I definitely need an ice cream cake. Looks fantastic. Love this…and the fact that it was for national s’mores day makes it all the more perfect. Thanks for sharing. it is nicely convenient that there are all these food holidays that encourage me to make new desserts! =) thanks for popping over – i just checked out your blog + you have some delicious-looking recipes, especially that spicy pizza. YUM! OH MY GOSH. i want this! now! i make an ice cream pie with toasted marshmallows on top and it is to die for! and i want to try yours, now too! it looks just amazing. 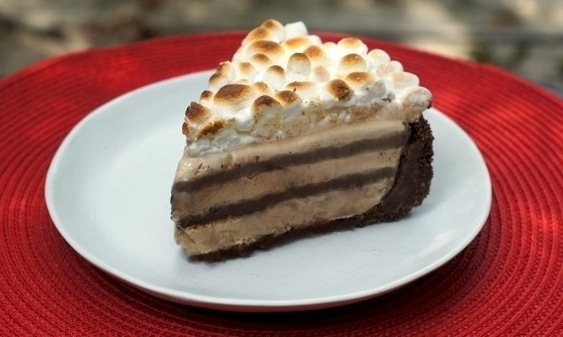 for everyone else, check out natalie’s s’mores ice cream pie post from a few months ago. looks divine! This looks incredible! All the layers, and deliciousness in one dish. Way to go with this one! yes! i love that all sorts of wonderful different flavors + textures are incorporated in one cake. two thumbs up! whoa, s’mores martini?! i’ve never had one – am going to google it now! sounds like something i’d looooove. Smores Day?!?! Why didn’t I know about this! Oh, I need to celebrate – can you send a piece over? you + i need to figure out how to send sweets via email – we’ll be millionaires! The number one all time greatest thing I have seen done with a s’mores recipe! Oh my. This is just fantastic!! it is, it is! i actually just sat down to a teeeny piece as an afternoon snack. delish! Just found your site…love it! I’ll definitely be stopping by often. 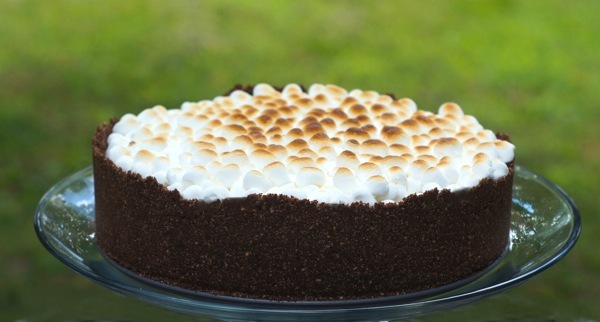 This s’mores cake is to die for! so glad you found your way over here + thanks for your kind words. =) i’m off to check out your blog now – i love getting to know new bloggers! Lots of good sweet ingredients in there. I love the burned marshmallow. the marshmallow is to-die-for — just amazing!